Chaos, confusion, disintegration fall with swift, breath-taking disaster upon America! Already terrorized by a tottering, unstable world, American men and women are swept into a mad stampede when the great leaders of the nation are spirited away, one by one, to return broken men, useless, inept. 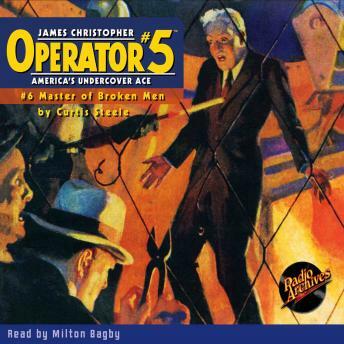 Here Jimmy Christopher - operator #5 - sets forth on his most thrilling and dangerous exploit while the great brains of America surrender to madness and despair; as a leaderless people seethe in revolt against a government which is crumbling before their eyes. How can Operator #5, single-handed, hope to prevail against that dread Master of Broken Men?